Perfect size for preschoolers, not so small that it is hard to see the pictures and not so big it is cumbersome. Written in language that 2-5 year olds understand easily and even asks questions throughout the story to keep them engaged. After each Bible story is a Family Time section where there are suggestions on topics to Talk about. There is a section to Do where it includes directions for a craft or a snack to make to go along with the story. Then there is a Remember section with a scripture for the preschooler to memorize. One thing I always look for in beginner Bibles are which stories are included. There are obviously hundreds of Bible characters that can be included in the stories. I like the basic characters that show God’s love and character, making it easy for the child to remember and understand the story. I am not big into scandal and conflict in children’s Bibles as they will soon enough be thrown into that. Stories that are hard to explain to a young child such as Abrahams sacrifice of Isaac on the altar, or David and Bathsheba’s hooking up are best left to young readers rather than young listeners. There is a story of Potipher’s wife and her accusation of Joseph that he “did something very bad”. The story emphasizes that the wife lied and Potipher believed her. It was handled in a way a child can understand and realize that not only good things happen to those who love God, that there are trials. I always love when the Wise Men arrive to find a 1-2 year old Jesus rather than showing up at the nativity scene as many Bible stories depict. Not something that really makes or breaks a Bible story book, but for me those things are key to a great Bible. 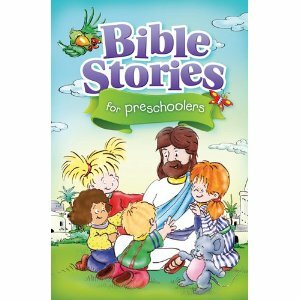 Biblically accurate and surely to be a favorite Bible for families with young children. I received a copy of this book from Tyndale in exchange for an honest review. Good Review. always looking for something for the children of all ages. wonderful artwork on the left side.